Star Wars Battlefront is an action first and third-person shooter video game based on the Star Wars franchise. 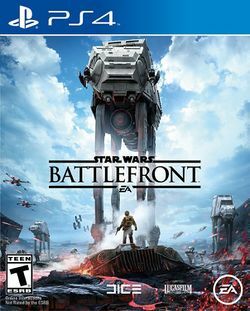 The third major release in the Star Wars: Battlefront series, it was developed by EA DICE and published by Electronic Arts. Despite this, it is not considered a sequel to the previous games, but rather a reboot. This page was last edited on 4 April 2017, at 22:25. This page has been accessed 4,635 times.